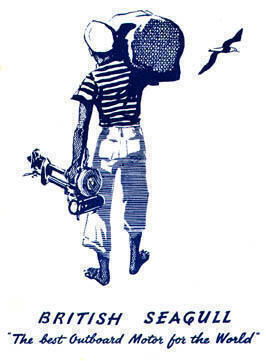 This page is dedicated to my classic British Seagull outboard motor, a Silver Century Plus Fixed Drive, Serial Number SP1718D8, which I purchased new on 23 June 1968. It still looks excellent, as you can see from the pictures below. And still runs as the first day! With the sole exception of the rubber tie-down on the tiller arm for the throttle cable (replaced with two black tie-wraps), and the fuel valve repair procedure detailed below, this motor has never required any major disassembly or repairs. It is still the same motor I received when new, except for normal wear, as I have replaced a few parts with new, original replacements when it has become necessary. Yes, most parts are still available new or used from a number of sources. After some four years of use with a custom-made 15-foot marine plywood dinghy, I lay it down for some 25 years. These were the years of my graduate studies abroad, and of the return to my country to establish my independent practice as a clinical psychologist. In 1998, I took my Seagull out of storage, gave it some tender, loving care, replaced the high tension coil cable and plug cap, the throttle cable, put in a new Champion D-16 spark plug (I decided to keep in storage the few original Champion 8-COM spark plugs I still have), repaired the fuel valve, cleaned and calibrated (gap of 0.50 mm/0.020" for both the points and spark plug) the contact breaker points and spark plug, and put in some fresh SAE 140 oil in the gear case (I replenish the oil after getting the water out which has entered the gear case, approximately after every 15 hours of use). Works like a charm since then. In 2000, I got a 4.9 m/16' in length aluminum Crestliner JRMV 1648 boat, which I use with my Seagull for fishing in dams, lakes, rivers, and, yes, quite daringly, in open waters of the Caribbean Sea when it is calm and the wind is down. The Seagull has always been a faithful, reliable, trustworthy, and, in all frankness and fairness, a very noisy and smoky companion. Typical fishing outing is some 8-10 hours running at one-half to three-fourths full throttle, only stopping to refuel. Of course, I continue to use the recommended fuel mixture in the proportion of 1 part of outboard oil into 10 parts of regular gasoline (1:10). Needless to say, I always carry some spares, like new spark plugs, propeller springs and retainers (washers and split pins), as well as several hand tools, including a gap calibrator. And, following the owner's manual, I always secure my engine (and all gear aboard) with a lanyard. My Seagull has always brought me and mine back to port, regardless of rain, wind, or how rough the sea has gotten. And I trust it will do the same for my children, when they become of age. This past Saturday was a scary day, for I went fishing with a friend in my little aluminum tin can, a 16-foot (4.9 m) Crestliner JRMV 1648. As usual and expected, no fish. We were in very deep waters, outside of the Bay of Salinas, in the southwestern shore of the Dominican Republic, way beyond the designed capabilities of the boat, but doing well. My pal, an experienced skin diver, was already seasick, after eating something that did not agree to his stomach. Then, an unexpected, and most severe, gust of wind went through all the area, raising the waves to the point of nearly capsizing the boat. Actually, there was a moment when I thought that the wind would lift out of the ocean and overturn the boat, which I think did not occur because of all the added weight of the water already inside the boat. The wind subsided as quickly as it came, and the waves gradually stopped coming inside the boat. I decided to bail out as much water as I could (with a 16 oz/475 ml Styrofoam cup), to improve our floatability. My friend sort of woke up when he started feeling the hardness of the bottom of the boat, as he had been suspended in part by the water inside. After I got most of the water out, I got to work on the engine and eventually got it going, but only after quite a bit of work. I even had to put some gas inside the cylinder chamber, as I think some water got inside the carburetor. Of course, I had some extra spark plugs, and had to replace them twice, as the water inside the motor quickly dirtied them. Eventually, the motor ran, sputtering for a minute or so, and then flawlessly, as usual. We had been thrown out to sea some 3-5 miles (5-8 Km). Luckily, the deep blue waters were quite navigable, with 2-4 feet (0.6-1.2 m) waves, and we were able to make it to shore. However, upon entering the bay again, the waves were about 4-6 feet (1.2-1.8 m) high, very much the limit of the boat, but with some skill and prudence, we were able to make it safely back to port. This was the first and, hopefully, the only time in some 40 years of going to sea that I felt that I was nearly losing a boat from under my feet. My thought was that I was going to lose the boat, and that somehow I would have to return swimming, but when I saw all we had to travel to get back to shore, the thought dawned on me that I may not have had the energy to have made it back swimming, as the shore was too far away. At that time, it was also clear to me that my friend would have lost his life at sea if we had gone under. The controversy is an interesting one, particularly when faced with environmental issues. Unfortunately, these issues were not considered as pressing ones at the time of the development and manufacture of the British Seagull. Rather, longevity and reliability of the engine were far more important attributes. At least, that is my impression, and definitively the reason why I am the proud owner of one since 1968. The manufacturer was very specific as to certain minimum conditions required for the Seagull, the theory being that little was required for it to work reliably, as long as those few rules were not broken. In particular, the oil to gas ratio of "one-part of oil to ten parts of petrol" as the "MINIMUM", the "DON'T REMOVE" the cylinder head, and the importance of the spark plug as the first suspect in any difficulty when starting or running the engine. And, of course, the oft-forgotten-until-the-engine-is-lost-at-sea, "to always secure your engine with a lanyard". Deciding to use "1 IN 10" as opposed to "1 TO 10" would only slightly enrich the proportion of oil to gas in the mixture, and theoretically protect even further the internals of the engine, while producing more smoke from the unburned oil (and we all know they produce a lot of smoke and noise, anyhow). This is consistent with the manufacturer's recommendations, as stated in the engine owner's manuals, in quotation marks above. The case in point with further reducing the amount of oil in the fuel mixture, e.g., 1:25, is that while better protecting the environment, one would have to do serious laboratory research to test the hypothesis that the new synthetic oils adequately protect metal parts conceived, designed, and machined for the 1:10 fuel mixture. I do not know of any empirical research done in this area. What I do know is that new Seagulls are no longer being built, and that many of the internal parts of these engines are no longer manufactured or not replaceable. So, I wonder, why put these engines at risk? Of course, the British Seagull will eventually become, for its quality and reliability, a distinguished museum piece, as it belongs to an industrialist era disrespectful of the environment. Meanwhile, I will try to use mine sparingly, but the way it was conceived by its engineer designers to be run: "one-part of oil to ten parts of petrol" as the "MINIMUM". The bottom row of pictures below shows a fuel valve repair procedure that I have developed. If you do use this technique, I would appreciate hearing your comments about your experience with it. What I have done with my old brass fuel tap is to replace the damaged cork seal with four, same-size "O" rings (in my case, automotive type, nothing special), OD 3/8" (0.375" or 9.525 mm) x ID 3/16" (0.1875" or 4.7625 mm) x Section 3/32" (0.09375" or 2.38125 mm), that is, of the appropriate size to produce sealing friction. This seems to be a permanent repair, as these "O" rings withstand contact with fuel, and are quite resistant to friction by movement. I initially performed this repair as a temporary solution, but this was several years ago, and the valve is still maintaining friction at the plunger, thus it is working fine. Actually, inspection after some eight years of use showed, as can be seen in the pictures below, some wear of the two "O" rings furthest into the fuel valve. However, the valve was still shutting off the fuel effectively. I just replaced the "O" rings with a new set of the same type and size. Upon installing the new "O" rings I noticed that the fuel holes in the valve produce a small nick on the "O" ring furthest into the valve, although this does not seem to affect performance, as the two orifices for the fuel inside the valve are offset. Further, repairing the fuel valve can be completed easily. All that is required is to drain all fuel by loosening the fuel hose from either end, and opening the valve by pulling on the plunger, if still operating. Then, remove the tap from the valve by loosening the retaining screw on the side of the valve. The valve body does not have to be removed from the fuel tank. Just carefully cut away the cork, after removing the plunger from the valve body, and fit in the set of four "O" rings. A bit of engine oil helps to push the "O" rings in place, but do not use any sharp tools in the process, as this will cause damage to the "O" rings. The "O" rings are kept in position by the plunger and by the body of the tap, and they produce a very effective seal. One other repair technique I have read about, but not used, is to boil the tap with the dried-up cork in order to revitalize it. Actually, I read about this after I had improvised with the "O" rings, so I did not try it. I am surprised that the original manufacturers of the fuel tap were using cork for this purpose, as it is a material that degrades easily. Particularly since "O" rings have been around for quite a while. Two special fuel-related situations: fuel is flowing out from the carburetor side, or when tilting the engine. The first is typical Seagull behavior, as this occurs after flooding the fuel chamber in the carburetor with the special plunger on a cold start. As soon as the engine is started, this overflow stops. If not, then you should suspect that there is dirt in the fuel chamber, or that there is a problem with the fuel needle or float. As to the second situation, the Seagull manual recommends to use up the fuel in the carburetor fuel chamber when reaching port by closing the tap and letting the fuel burn prior to tilting the engine, or else it will spill out. Do remember not to tilt the engine past the horizontal. I want to remind Seagullers of a tip oft repeated in the Seagull manuals and oft forgotten: secure your engine with a lanyard. This is often overlooked and the cause of many lost engines overboard. mm. Both parts of the main frame member (alloy and bronze) seem to be in mint condition." I could not get any specific answer as to why this was occurring. I remember that Bryan A. Nelmes, the Sailorman tech at the time, told me he even contacted the factory on this problem, but no results. I solved the problem by adding an appropriate-size "O" ring to one side of the support lug, held in place by the security bar. This was several years ago and it is still fine. When you click on any of these images, a new page opens with the same image enlarged, while keeping open the main page. To properly view the image, you may have to zoom-in on the image by clicking on the image itself, and then on the icon which appears. Alt + Tab in your keyboard. If you want to contact us with a request for information or to offer us your comments, please write us an e-mail at seagull@idpp.org. Please see other contact options at Contact IDPP. Thank you for visiting this page and come back soon!